The Cruising Association (CA) is delighted to have partnered with marine safety experts Ocean Safety to launch an exclusive-to-members 2019 big prize draw with valuable prizes worth a total of £2,380. CA members can enter at any CA-run event they attend from 1st February 2019, or by emailing a picture of their burgee being flown anywhere in the world. The Draw will run until September 2019. The prize is one award-winning 4-person Ocean ISO Liferaft packaged in a bespoke canister. 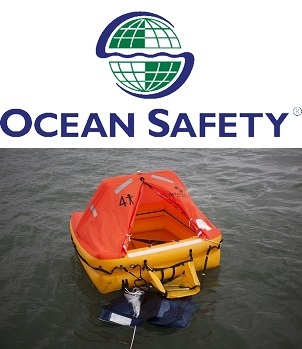 The Ocean ISO 9650 liferaft is compact and of superior design and construction. The value is £1,985. In addition to the Liferaft Ocean Safety is supplying an EPIRB, the essential safety product for your boat. The rescueME EPIRB1 is supplied with integrated GPS as standard, with clear benefits including accurate position information being transmitted promptly to the emergency services. When activated, the rescueME EPIRB1 transmits your position and your unique ID to a Rescue Coordination Centre via satellite link. This information is then forwarded to the relevant local Search and Rescue services. CA members can enter at any CA-run event, or by emailing a picture of their burgee being flown anywhere in the world to: office@theca.org.uk before September 2019. Members recommending new members will also be automatically entered into the draw. A reminder too that Ocean Safety offers a discount on their products to members. Visit the Discounts page for details (you must be logged in).